SAN ANTONIO (Oct 20, 2017) – HandBid, the native mobile bidding and fundraising technology company for non-profits, has teamed up with Silver & Black Give Back, to maximize fundraising revenue as the San Antonio Spurs open the 2017-18 season. San Antonio Spurs fans can now bid on many great signed memorabilia and one-of-a-kind experiences now by visiting Silver & Black Give Back at SBGB.org. 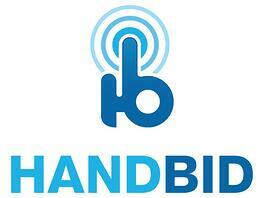 The HandBid mobile on-line auction is open now and will close Monday, Oct. 23 _ at 10 p.m. (CDT). Download the HandBid app for iPhone or Android now and start bidding today. For more information concerning HandBid visit www.HandBid.com. Silver & Black Give Back is a 501(c) (3) public charity that invests in the community in partnership with the entire Spurs Sports & Entertainment family of teams. Since 1988 coaches and staff have focused on fostering young talent and enriching the community by encouraging local youth to become responsible adults and give back through programs like the Spurs Youth Basketball League and the Team Up Challenge. Together, our community has the power to empower and create lasting change throughout San Antonio. More information on Silver & Black Give Back can be found at SBGB.org. HandBid’s mission is to provide non-profit organizations a native mobile silent auction app solution to better engage with their bidders, via smartphones, iPads and websites, with less effort, superior results and the platform manages every aspect of the auction. In addition, auction managers rave about how easy it is to manage their silent auctions while increasing revenue opportunities utilizing cutting-edge technology, revolutionizing the mobile auction category. Auction managers can also fine tune the way they can showcase auction items, send text messages to invite potential bidders, issue push alerts when bidding is coming to a close and even track real-time performance throughout. Handbid Releases 2.22: Favorite Items and QR Codes! Handbid Releases 2.21: Including Two Brand New Features + More Updates and Upgrades! Handbid Releases 2.20: The Puzzle Project, A New and Improved Android App, and Much More! Handbid Releases 2.19: Guest List Updates, Pre-sale Items in Preview Mode and Many More New Features!